OK, Libs, raise your hand, if you don't see the humor in it. We'll explain it. Lib asks the bartender, "Is that deal only good for the first beer?" Stolen line from *ME* I've been using that since 1970. Usually as a "check" to see if people are paying attention while I'm speaking. If their eyes light up, I quit talking. If they laugh, I continue. Bartender tells the two guys, just the first beer is "Two For Two", then snickers awaiting a reaction, then suddenly the two guys start arguing over who gets to buy the first round at the perceived discount. and the Third ONE for the price of One!" and I'll throw in the Third ONE for the same price!" the Third for half-off that!" and I'll throw in the Third for the price of TWO!" Tell them you can break a Twenty - slap the change in their hand and vanish asap. 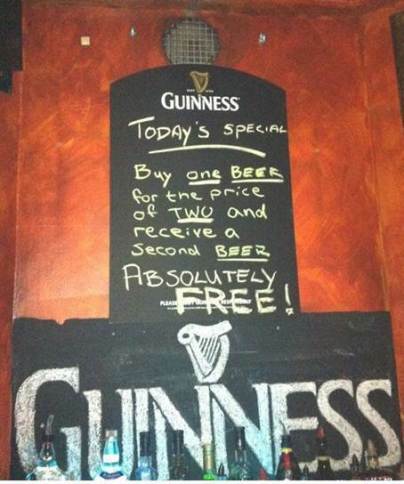 The second beer is free due to the fact that you will still pay it as the first beer price is twice its original price. I am loving the humor.